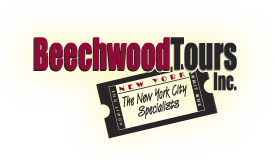 Save yourself time and stress by letting Beechwood Tours help plan your sight seeing while visiting in New York City. Book your sightseeing by calling us at 1888 633 7315 or send us an Email:sales@beechwoodtours.com. Narrated tour loops in NYC! Offers the best sights in Manhattan and Brooklyn with hop-on, hop-off service at over 60 stops and connecting transfer points to switch from one tour loop to another. Create your own way to see New York on the popular Loops Tours. Experience the history, magic and excitement of Manhattan. From Times Square to Harlem, from the Statue of Liberty to the Empire State Building, see it all from our double-decker buses with unlimited hop-on hop-off sightseeing opportunities to explore, dine and shop at New York’s major attractions. Tour Length: Approx. 2 to 3 hours per loop. All tours are hop-on, hop-off tours. Downtown Loop Tour: Neighborhoods on the Downtown Loop are some of the oldest and some of the newest in Manhattan. Stops will include Greenwich Village , the new and exciting Times Square, Empire State Buildin, as well as the Union Square shopping district, Soho, Chinatown, Little Italy, East Village, Rockefeller Center, Intrepid Sea-Air-Space Museum, the 911 Memorial site, and more! Cost: $44 per person (valid for 24 hours). Ferry to Statue of Liberty Island and Ellis Island Optional for an Additional $18 per person. Uptown Loop Tour: See Central Park, The Museum Mile, Grant’s Tomb, Apollo Theater and hop off on Fifth Avenue for a little shopping. The uptown tour offers historical and cultural landmarks as well as a drive past beautiful uptown neighborhoods of the rich and famous. All Loops Tour: This tour combines the Uptown & Downtown tours where you’ll be able to see all of Manhattan! Times Square to Harlem, Battery park to the empire State Building and much more! Cost: $54 per person (valid for 48 hours). Ferry to Statue of Liberty Island and Ellis Island Optional for an Additional $18 per person. Step aboard World Yacht, The New York Dining Cruise, and discover New York and the island of Manhattan the way Henry Hudson did centuries ago. Cruise down the Hudson River as you enjoy fine American cuisine in a setting of elegant service and modern design, accompanied by the most exceptional views of Manhattan. World Yacht is a true American Experience, celebrating the history and culture of a city that continues to inspire people from all corners of the world. Save yourself time and stress by letting Beechwood Tours help plan your sightseeing while visiting in New York City. Let our experience be your guide to the best way to see and enjoy all the city has to offer.